N95 Particulate Respirators Masks Box of 20. 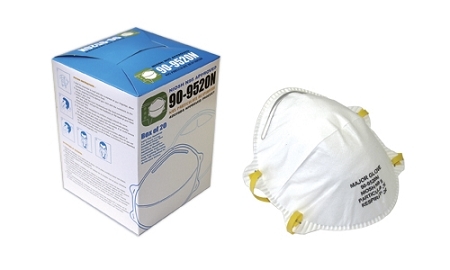 N95 NIOSH approved (TC 84A-3713) particulate respirators. Model N95. Economical alternative to 3M 8210. Polypropylene. Adjustable aluminum nose bridge. Round masks fits over mouth and nose. Comfortable nose foam. Two latex-free head straps. Compliant with 42 CFR Part 84. Meets CDC guidelines for TB exposure control. 95% filter efficiency level which is effective against particulate aerosols free of oil. Not for use in atmospheres containing less than 19.5% oxygen or atmospheres immediately dangerous to life or health. They can be used in labs, for painting, for doing household projects, and for general protection against respiratory viruses.